Sometimes a book, a character, or a creative team, just don’t click for you no matter how hard you try to like them. The elephant in the room for me for example is Deadpool, never liked the character or the comics (though admittedly the film is very good). 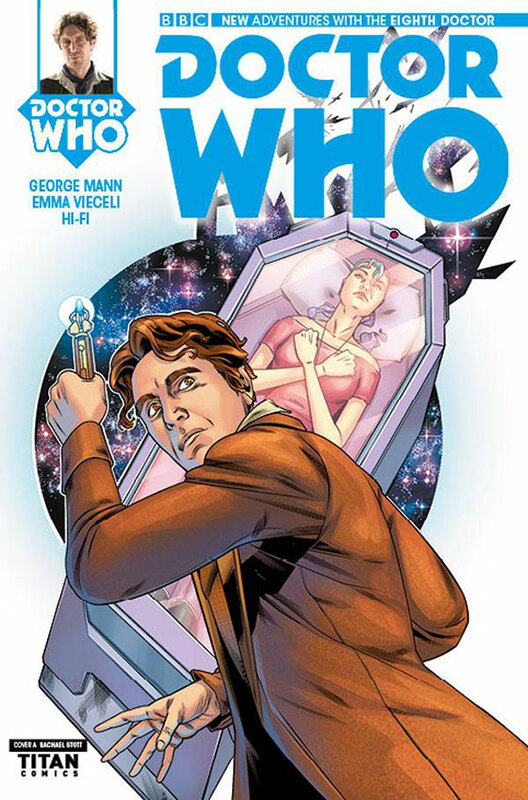 It has been much the same with this 5 issue series, George Mann’s writing has failed to really impress and Emma Vieceli’s visuals have been just too cartoony. Not badly written or drawn in a technical sense, just not pushing the right buttons for me. I was really hoping this final issue could make a liar of me, persuade me that this mini-series needs at least a partial reappraisal. So where were we? The Doctor and companion Josie have been checking off their mysterious ‘to-do’ list, visiting various places listed on it. This time they find themselves in space on a Bakri resurrection barge, a kind of futuristic spa where people can literally be regenerated into new synthetic bodies. A murder takes place, and The Doctor and Josie are arrested as chief suspects, being identified as unauthorised people on board. Although locked up, one sonic screwdriver later they are out investigating their framing, and the problem soon becomes obvious. The synthetic bodies have personalities of their own, and the Bakri have been ‘cutting and pasting’ the new personalities over the top, so two personalities are fighting for dominance in the same body. The story this issue felt more rounded and thought out than the previous four combined, and the central concept was intriguing. The question over sentience and artificial life, where true life actually begins and what rights it has, proves to be of even greater importance when we discover a major secret concerning Josie. I won’t spoil it, but I never saw that coming. Paul McGann’s Doctor also gets to deliver a set piece speech, showing even nice regeneration’s like him can lose their temper sometimes. The Doctor wraps things up nicely, before we get a second major surprise, a nice reveal as to how Josie ran into The Eighth Doctor at the very beginning of the story. Let’s just say it features a cameo from a slightly more recent, gruff incarnation and now departed companion. This issue nearly made up for the disappointing ones preceding. The main story was fun in itself, but the reveals, the excellent characterisations and dialogue, made for a very strong finale. Much more originality here, a story with something to say and a plot with somewhere to go. I am afraid I still struggle to appreciate the art though, still too cartoony for my taste overall. Nothing wrong with the layouts or the panel composition, but it just feels a little ‘all-ages’ middle of the road. Maybe I’m just getting old. Without doubt the best was saved for last. If George Mann wanted to finish with style and try and get an ongoing title green lit he couldn’t have done much better than this. I would hope to see more consistency and originality if Mann remained as writer on any future title, but this issue shows me he is capable of upping his game a notch or two when required to. A fitting series finale for a character that deserves to continue to be seen and developed more, a character that clearly has plenty of adventures still to be revealed.